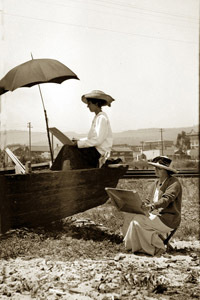 February 22nd, 2015 – 3pm-5pm: Julianne Burton-Carvajal is back to share some of the amazing photographs that have been discovered showing Monterey’s art colonies in the 1910s and 1920s, and has printed selections of them in her new work Artists’ Honeymoon: Rowena Meeks Abdy & Harry Bennett Abdy – At Work & Play in Monterey and Beyond, 1910-1920. Head over to Old Capitol Books on February 22nd, to see these amazing photographs and hear about their discovery. “Thanks to artist Rowena Meeks Abdy and writer Harry Bennett Abdy, who recorded their extended honeymoon with hundreds of photographs, lovers of the Monterey Peninsula and the California coast are invited to step back in time. “The following pages unveil an insiders’ view of the local art colony 100 years ago. Concept, design, essays, and captions were developed by historian Julianne Burton-Carvajal, author-editor of several books and curator of a score of museum exhibitions linking regional history and the visual arts. Previous PostNetworking Aloud! A Monthly Opening mic – January features: Sharon Law Tucker & P. A. SpeersNext PostLive at the Bookstore – The Brothers Strong & Co!